Why It's Easy — And Hard — To Get A Postcard All The Way From Timbuktu : Goats and Soda When tourism to the fabled city took a downturn, two guys came up with an idea to bring in a little income for the local tour guides. A message on a postcard addressed to a school in the United States. These days, not many tourists go to the legendary city of Timbuktu. Indeed, the U.S. State Department advises: "Do not travel to Mali due to crime and terrorism." But you can still send a postcard to a family member, a friend or even yourself, all the way from the fabled, mud-walled city. Postcards from Timbuktu was established in 2016 by Phil Paoletta, an American hotel owner from Cleveland, and Ali Nialy, a 29-year-old guide from Timbuktu. The goal was to make up for some of the income lost by tour guides after the devastation of the tourist industry, which once brought an estimated 200,000 people a year from all over the world to Mali. Many of them came to visit the city of Timbuktu, a World Heritage site known for its spectacular mud mosque and ancient Islamic manuscripts and annual music festival, the Festival Au Desert (the event has been suspended indefinitely). The worst time for the city was the 10 months, starting in 2012, that jihadists took over. They brutalized the local population, smashed Sufi shrines and razed restaurants and bars. French and Malian forces pushed the jihadists out in 2013, but the tourism business has never recovered. The idea for a postcard project came about after a friend sent Paoletta a card from United States, the first piece of mail he had received in his six years in Mali. That made him remember how nice it was to get mail — and got him thinking about the possibility of sending postcards from Timbuktu. That same day he met Nialy, an unemployed tour guide and friend from Timbuktu. Nialy had run tours for Paoletta's business partner, the co-owner of his hotel, the Sleeping Camel, and operator of a tour company. Paoletta asked Nialy if the post office was functioning and wondered how long it would take to send a postcard to, say, the United States — and whether sending a postcard from a place that's often referred to as the "end of the earth" could be a viable business. They did a test run and a card reached a U.S. address in a matter of weeks. 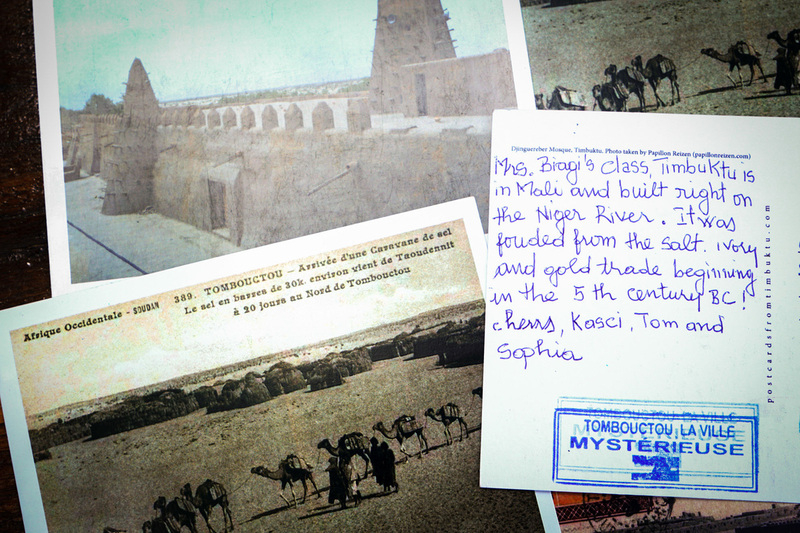 Getting postcards from Timbuktu, Mali, to destinations around the world is a lengthy process. Daba Traoré, center, takes the postcards — which have been flown in from Timbuktu on a U.N. plane — to the central post office in Bamako. So Paoletta set up a website, Nialy gathered a team of guides to handle the logistics and they launched the venture. Nialy and other guides accept that tourists likely won't come back for a long time, given the ongoing insecurity. This year he has only worked with a handful of tourists, who must be escorted by heavily armed police and stay in hotels flanked by armed guards. He advises them against staying for longer than 24 hours, due to the threat of kidnapping. Nialy also acts as a fixer for journalists. But like many of the other guides in Timbuktu, he is deeply attached to the city, his hometown, and doesn't want to move. "I like it, and I don't want to leave," he says. "We feel indebted to them because when tourism was thriving, we were all doing well," says Paoletta of the guides. "Now we're sort of doing okay [at his hotel] because we have these U.N. clients and NGO clients who are in Bamako." But that isn't any help to Timbuktu. Paoletta lives in Bamako, the capital of Mali, some 600 miles from Timbuktu. He works with a local company to print a variety of postcards, which are displayed on the website. They range from images of turbaned members of the ethnic Tuareg group on camels to black-and-white frames of old camel caravans. Either Ali or one of his friends or family members transport the cards by road back to Timbuktu. Paoletta publicized the initiative through Facebook and Twitter accounts and ads on Instagram. Customers vary, he says. They include postcard collectors, people who have traveled to Timbuktu or worked in Mali or people who have seen documentaries on the country and some who want to send a postcard as a joke. The company pays local guides to write the message requested by the customer. Since 2016, the company has sent out 1,958 postcards to countries in Europe, to the U.S., to a raft of Latin American countries, to Asian countries and to neighboring nations in Africa. They also sell the work of Mali's last master calligrapher, who is training others in the art, and offer jewelry, handbags and salt from the Sahara desert. Ali Nialy, pictured above, heads the team of tour guides that handwrite the messages for Postcards from Timbuktu. The cost is $10 per card. The guides who write the messages and handle the mailing can make between $2 and $4.50 per card, depending on postage costs. It turns out to be more complicated than you might think to get a postcard from Timbuktu to, say, Kentucky or Chile or South Korea. Paoletta sends the orders to the guides in Timbuktu via WhatsApp. They then handwrite the messages requested by customers on the card (usually in English but in various other languages, including Russian, French, Italian, German, Dutch, Chinese, Thai and Spanish). People often request birthday messages, quirky notes, love letters. Sometimes customers ask the guides to write about their day in Timbuktu. "Our only customer is Ali," says Nana Oumou Maïga, one of two postal workers. She may be exaggerating — but just a little. Now comes the tough part: getting the cards to Bamako, where they can be mailed via airmail. Vehicles delivering mail on the bumpy stretches of road from Timbuktu to Bamako are often hijacked or robbed by bandits. So the guide will give the cards to a friend of Ali, who regularly travels on the U.N. mission flight, the only regular flight in and out of the desert city. Next, a staff member from the Sleeping Camel picks the cards up at the airstrip in Bamako and brings them to the post office to be mailed. It takes anywhere from three to five weeks for a card to arrive at its final destination. The initiative employs around six guides part-time and has employed up to 10 when demand has been higher. When there is an order of larger batches, say 100 cards, the guides can earn a decent income in a country where the average gross national income per capita income is US $770. The guide is paid using mobile money, transferred via cellphone. "Opportunities for work in Timbuktu and in the north in general are extremely limited right now. These guys were in the once-thriving tourism sector that has completely collapsed since 2012," Paoletta says. 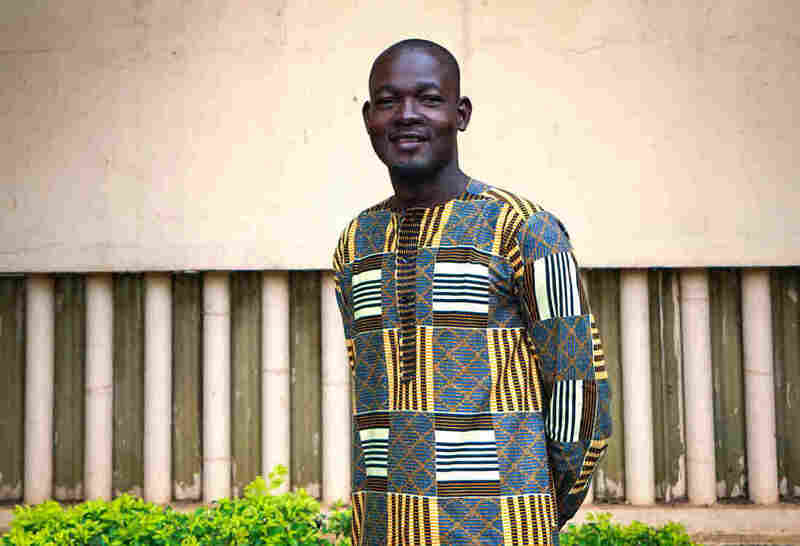 "I think it's really a very good initiative," says Mamadou Tapily, a spokesman for a network of Malian tour guides. Tapily says the government and Ministry of Tourism needs to do more to ensure the guides are employed. "The guides did a lot to show the beauty of Mali and now no one is thinking about them." Customers are happy to send postcards from Timbuktu because they're helping the locals and because of the novelty factor. When Cheryl Cullick, a postcard collector from Bellevue, Kentucky, found out that she could order cards online from Timbuktu, she wondered: "Is this for real?" Cullick didn't know exactly where Timbuktu was and had only heard it referred to in "literature." Cullick has been collecting postcards since her college days in the 1980s. She rarely travels outside the U.S. and seeks postcards from places she'd like to go. Cecilia Op de Beke, from Falls Creek, Virginia, lived with her aid worker husband in Bamako, between 2012 and 2015, but they couldn't go to Timbuktu because of the threat of attack. Now she sends birthday cards to friends and family members and hopes that the support to the guides makes a difference. For her, the project is quirky and fun. And when an acquaintance gets a postcard, she says it sends the message: "This is how far I go for you — all the way to Timbuktu."